(Faber Piano Adventures ). 64 pages of fun-filled activities support the music learning process. Reading steps on the staff is a primary focus of Book B. 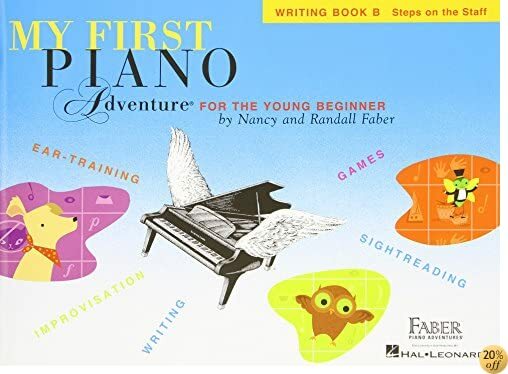 The inventive Writing Book guides young players in reading, hearing and creating with steps on the Grand Staff. Teachers will welcome the special C.L.A.P. for Sightreading pages, designed to reinforce and celebrate note-reading. Students touch on music history with Mozart's and Beethoven's Fun Facts and Games and take a peek into Beethoven's Composing Room. Tucker, Blinker and Tap return with ear-training, sightreading, and rhythm fun. Then there is also the Tooth Fairy Visit, Rhythm Beads, Escape of the Quarter Notes... and much more.